, an eminent German civilian and historian, was born in 1631 at Flaeh, a little village near Chemnitz, in Upper Saxony, of which village his father, the descendant of a Lutheran family, Elias Puffendorf, was minister. 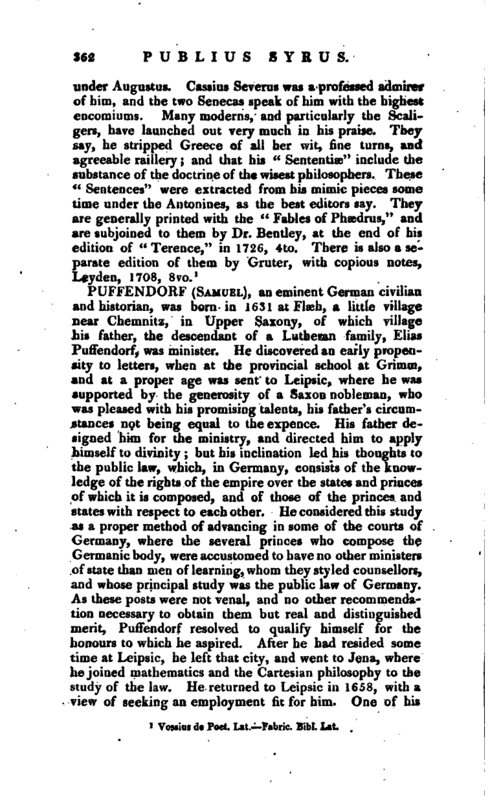 He discovered an early propensity to letters, when at the provincial school at Grimm, and at a proper age was sent to Leipsic, where he was supported by the generosity of a Saxon nobleman, who was pleased with his promising talents, his father’s circumstances not being equal to the expence. 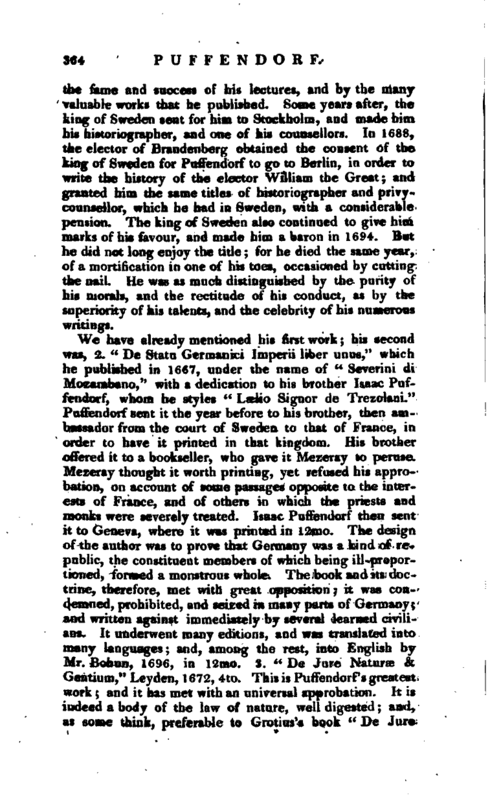 His fajher designed him for the ministry, and directed him to apply himself to divinity; but his inclination led his thoughts to the public law, which, in Germany, consists of the knowledge of the rights of the empire over the states and princes of which it is composed, and of those of the princes and states with respect to each other. He considered this study as a proper method of advancing in some of the courts of Germany, where the. several princes who compose the Germanic body, were accustomed to have no other ministers of state than men of learning, whom they styled counsellors, and whose principal study was the public law of Germany. As these posts were not venal, and no other recommendation necessary to obtain them but real and distinguished merit, Puffendorf resolved to qualify himself for the honours to which he aspired. After he had resided some time at Leipsic, he left that city, and went to Jena, where he joined mathematics and the Cartesian philosophy to the study of the law. He returned to Leipsic in 1658, with a view of seeking an employment fit for him. One of his | brothers, named Isaiah, who had been some time in the service of the king of Sweden, and was afterwards his chancellor in the duchies of Bremen and Werden, then wrote to him, and advised him not to fix in his own country, but after his example to seek his fortune elsewhere. In compliance with this advice, he accepted the place of governor to the son of Mr. Coyet, a Swedish nobleman, who was then ambassador from the king of Sweden at the court of Denmark. 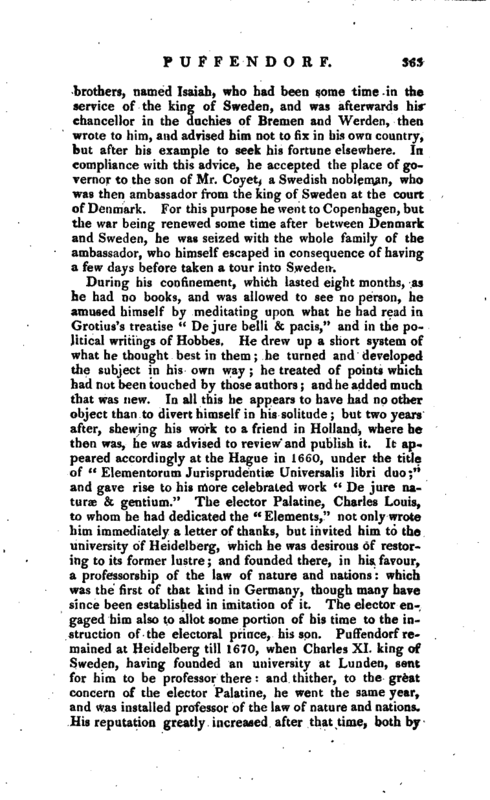 For this purpose he went to Copenhagen, but the war being renewed some time after between Denmark and Sweden, he was seized with the whole family of the ambassador, who himself escaped in consequence of having a few days before taken a tour into Sweden. 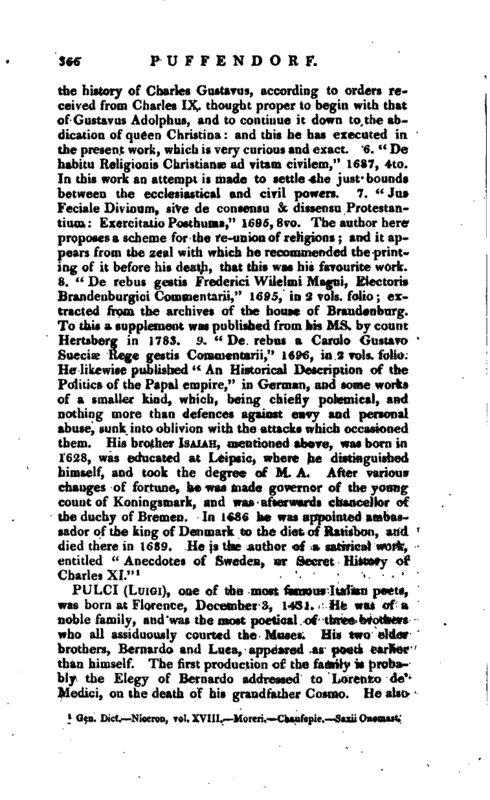 During his confinement, which lasted eight months, as he had no books, and was allowed to see no person, he amused himself by meditating upon what he had read in Grotius’s treatise “De jure belli & pacis,” and in the political writings of Hobbes. He drew up a short system of what he thought best in them he turned and developed the subject in his own way he treated of points which had not been touched by those authors and he added much that was new. In all this he appears to have had no other object than to divert himself in his solitude; but two years after, shewing his work to a friend in Holland, where he then was, he was advised to review and publish it. It appeared accordingly at the Hague in 1660, under the title of “Elementorum Jurisprudent Universalis libri duo;” and gave rise to his more celebrated work “De jure naturae &^gentium.” The elector Palatine, Charles Louis, to whom he had dedicated the “Elements,” not only wrote him immediately a letter of thanks, but invited him to the university of Heidelberg, which he was desirous of restoring to its former lustre and founded there, in his favour, a professorship of the law of nature and nations which was the first of that kind in Germany, though many have since been established in imitation of it. The elector engaged him also to allot some portion of his time to the instruction of the electoral prince, his son. Puffendorf remained at Heidelberg till 1670, when Charles XL king of Sweden, having founded an university at Lunden, sent for him to be professor there and thither, to the great concern of the elector Palatine, he went the same year, and was installed professor of the law of nature and nations. His reputation greatly increased after that time, both by | the fame and success of his lectures, and by the many valuable works that he published. Some years after, the king of Sweden sent for him to Stockholm, and made him his historiographer, and one of his counsellors. 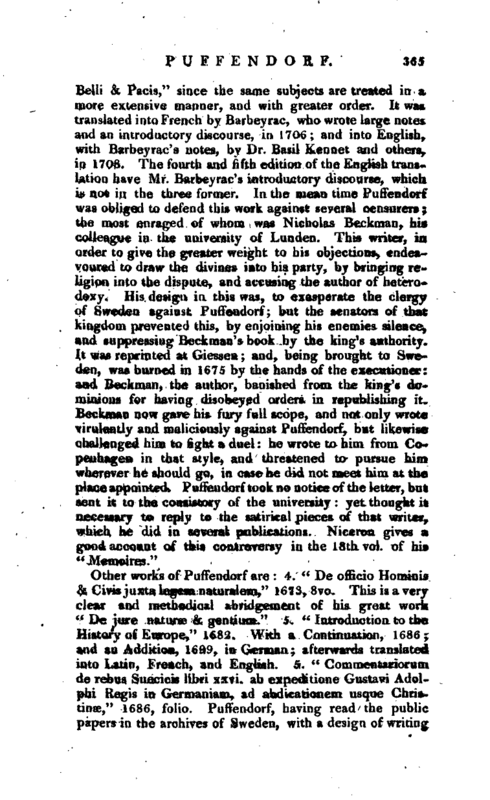 In 1688, the elector of Brandenberg obtained the consent of the king of Sweden for Puffendorf to go to Berlin, in order to write the history of the elector William the Great; and granted him the same titles of historiographer and privycounsellor, which he had in Sweden, with a considerable pension. The king of Sweden also continued to give him marks of his favour, and made him a baron in 1694. But he did not long enjoy the title for he died the same year, of a mortification in one of his’toes, occasioned by cutting the nail. He was as much distinguished by the purity of his morals, and the rectitude of his conduct, as by the superiority of his talents, and the celebrity of his numerous writings. 1 Gen. Dict. —Niceron, vol. XVIII.—Moreri. —Chaufepie. Saxii Oaoeiast.